(Li Hing Hula) Are you looking for a more dynamic way to enjoy time with your friends and family? Try a MUVE dance along- a quick 4 minute break to shake off your day, energize your body and enjoy dancing with your company. MUVE is a multi-generational, always spontaneous dance exercise. You dance just the way you like it. If you want inspiration you can follow the movement ideas of a lead-dancer called the MUSE. This role can be played by anyone. MUVE is community dance, either in a group or individually in front of a TV or computer. Our message is "you can't do it wrong" as long as you have fun, mind your body's needs and of course others. To date there are over 200 MUVE dance-along videos you can enjoy at http://www.muve.org. Today's dance along exercise is from the Mellow MUVE, a home workout DVD with low impact dance exercises for parents, children and seniors, in short the whole family. We are currently SOLD OUT of our DVD's but no fret, all fitness dance alongs are viewable for free on our webpage. All ages can dance together! MUVE is a dance method that helps people realize that moving to music is easy, fun and also effective in improving physical and mental wellness. Take advantage of the free video workouts online at the video blog http://www.muve.org/blog/. These simple dance move exercises can be done in front of the computer and are free for everyone! (Time Warp) This MUVE Dancing Game is called "Follow 3 MUSES" You can check out all the MUVE dancing games at http://www.muve.com/muve-dancing-games/. MUVE provides opportunities for folks to have fun together by dancing, being creative and even sneaking in a bit of exercise. This video highlights a Dance Event created for families and children of all ages. These classes are multi-generational exercise for the whole family to enjoy quality time together. 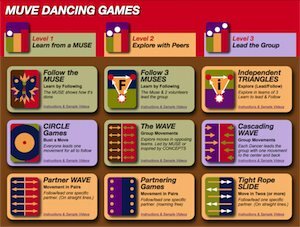 In this game 3 Muses alternate leading the whole group and all players follow the Muse in the center. In every group there are individuals who love to share their MUVES and don't mind being the center of attention throughout the whole song. The concept of one Muse inspiring the whole group unites the players for a community movement action. Leading the whole group might be intimidating for some, but it is also a special thrill for those outgoing personalities- a fine practice of leadership skills. (Glam Tidings) No better way to get into the Christmas Spirit than by dancing around in the living room! Here you see Maggie and her little friends following the lead of 3-year-old Allen. He learned how to dance spontaneously all by himself by following along to his MUVE DVD easy dance exercises. 5 months later he can create his own moves on the fly - as demonstrated here. Use the many dance-along videos at the MUVE website or YouTube Channel to get energized and make you body and mind feel good. If you are just watching you are missing the point. It's about how it feels and not how it looks! Happy Healthy Holidays from us to you. PS: Especially check out the Office-MUVE Series, my favorites when it come to dancing along. MUVERS from ages 3 - 80+ dance for the Great Aloha Run Expo on 2/13/2010. This dance along video shows how people of all ages can adjust their movements to fit their individual needs. MUVE dance exercises are always freestyle dance moves. They are simple dance routines as well as low impact cardio exercises. It's hard to motivate yourself to exercise, so why not dance along and let us help you get in shape at home, right in front of your computer. This dance is from the low impact exercise DVD Mellow MUVE. Especially fun is the music on this one - it's comical as well as a bit sensuous! Dance like nobody is watching!